We have a couple bird feeders, bird houses and a bird bath on our property. This of course attracts the squirrels who use the bird bath and eat the fallen seed. This past spring, Finches used the bird house in the front twice to nest and lay eggs. The bird house in the back yard, designed with a larger opening for the Mourning Doves, has never been used. Those squirrels sure are agile creatures! 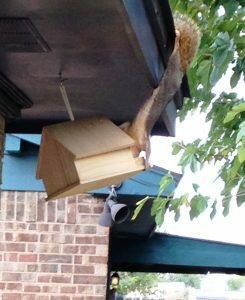 This entry was posted in Animals, God, God's creation and tagged bird feeders, brown squirrels, Finches, Mourning Doves, Nature. Bookmark the permalink. God bless your home for hosting a nest for the finches! DCG, loving Nature makes us closer to GOD. May God bless us all. We have the same thing going. When the birds and squirrels are through the possums come out. What they miss our chickens get. 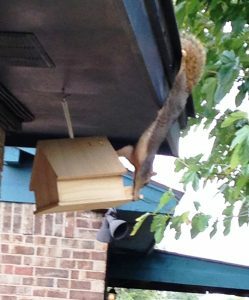 Squirrels and raccoons are experts at “Hang Ten” and it’s so fun to watch!